Secondly, I’ll be at NDK in September. It’ll be my 5th year there and I’m looking forward to it because it’ll be their 20th anniversary. In the meantime, keep checking the site. I know updates have been intermittent at best, but things have been very rough for me with little change for the better. I just recently lost my internet. Updates will come up when they can. Sorry for the abrupt, unannounced hiatus. December ended up being an incredibly hard month for me, and quite frankly I almost quit doing my comics. I’m feeling a lot better now so updates have returned. I will try to keep weekly updates, but please understand that I am not 100% healthy and never will be. So there probably will be update gaps in the future. As long as no one gives me a hard time about it, everything will be fine. Well my darling deviants, it’s been an interesting journey so far. Three years ago today, I introduced the world to my favorite idiots, Shawn and Romero. That’s right, today marks the 3rd anniversary of the series. So what have I managed to do in 3 years? I’ve produced almost 6 full color chapters (if you would have told me that 5 years ago that I’d be working in color I’d have called you crazy because I’m not *that* masochistic. Ha ha ha.) 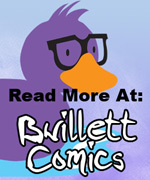 I’ve had reviews and interviews because of the series and I’ve been selling issues on Comixology. But more importantly, it’s what you guys have been doing. Every person who has read the series, left a comment, bought an issue and told their friends about a ginger almost too dorky to live and his supernatural suitors are what have allowed me, and motivated me to keep working. If no one read the series, I’d have quit a good long time ago. So pat all of yourselves on the back, because Midnight goes on because of you. So what’s coming in year 4? A LOT. The Mad Dog arc is coming to a close (with some big things coming in this chapter, what you’ve been reading so far is just the build up) and the next story arc I’m especially excited about because it will finally introduce the final main character of our ragtag group of paranormal misfits. 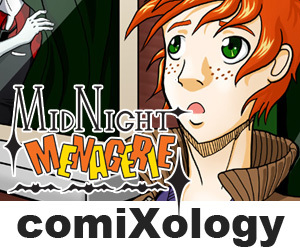 Also, I have a convention coming up at the end of April where I plan to be selling prints and issues of Midnight Menagerie, plus I am hoping to launch a Kickstarter campaign to get a printed version of Midnight Menagerie v.1. So once again, thanks a ton for the support. Love you guys and Happy Anniversary!